One of our friends recently gave us a container of butter cookies made by her uncle. 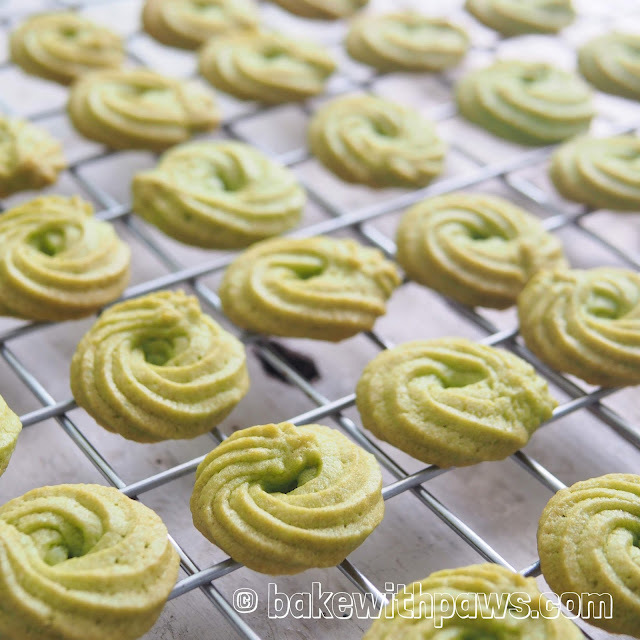 The cookies were so crunchy and light, I would say it is probably the best butter cookies I ever tried. However, my girlfriend told me it is a secret recipe, that her uncle has not shared. I was very curious and experimented with the following recipes. I also love pandan. 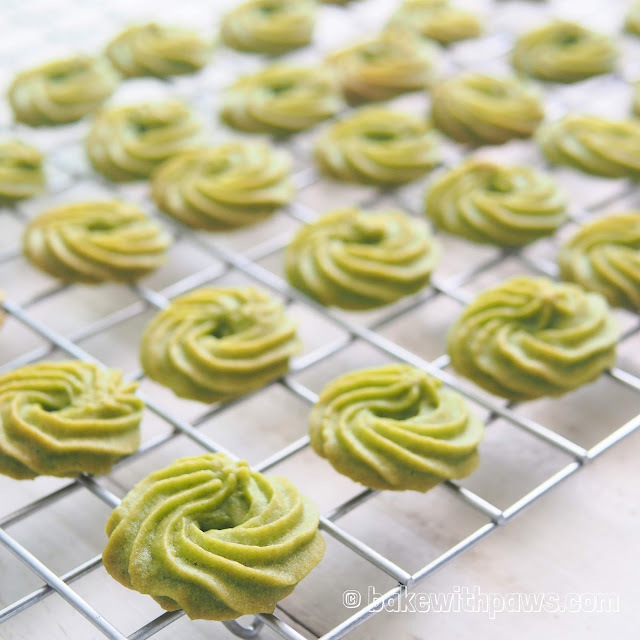 So, I thought it might be nice to have Pandan Butter Cookies as something special. Outcome of both recipes. Recipe #1, with no egg and less baking powder yielded cookies that didn’t have that light crispiness I was looking for. However, the shape turned very well after baking. Nevertheless, friends who tried it still loved it. Recipe #2, uses egg and more baking powder. This second recipe gave me that crunchy light cookie I wanted and it is very close to the cookies made by my friend’s uncle. But, it didnt' hold the shape well because of more baking powder is used. My conclusion is that Recipe #2 is better. However, it is up to individual preference. Sift flour and baking powder into a bowl, stir in salt. Set aside. 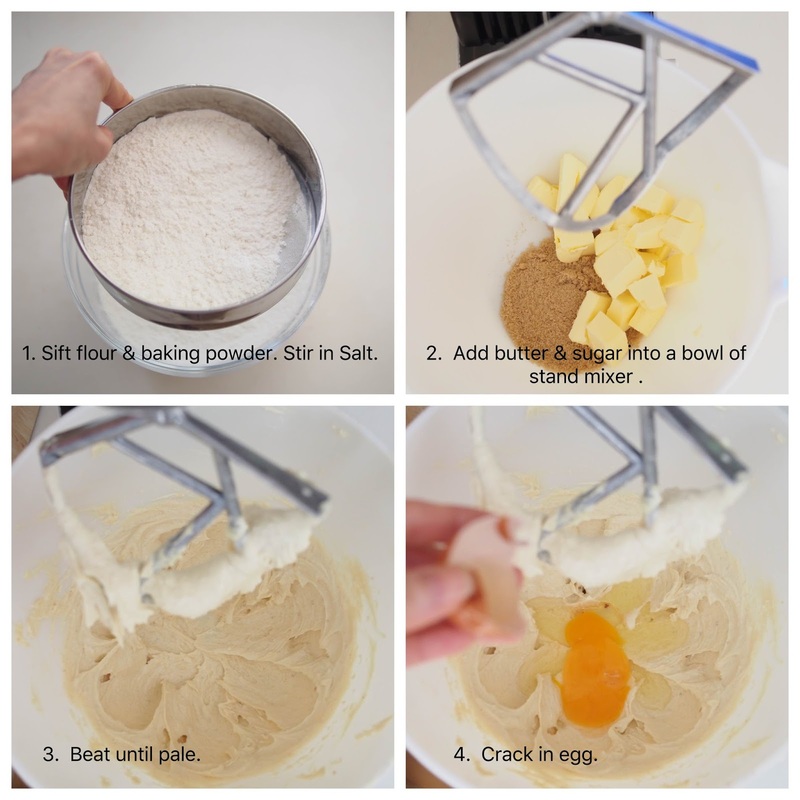 In a bowl of electric mixer, beat together butter and brown sugar until fluffy with the paddle attachment. Crack in egg for Recipe 2 and beat till well combine. Lower the speed, add in pandan juice and mix well. Gradually add in flour mixture and mix until form a smooth dough. 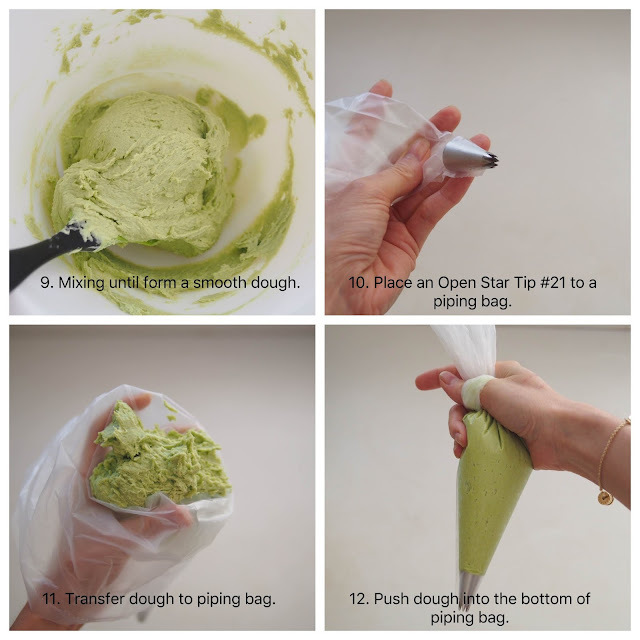 Transfer the dough to a pipping bag fitted with a open star tip #21 and pipe cookie dough into ring shape. Bake at preheated oven for 10 - 12 minutes, or until golden brown. Hi I'd like to give your recipe a go. If I were to substitute pandan juice with pandan extract, how many tsp would you think is needed? (The color I can get with a dab of food coloring.) Thanks! I am so sorry for the late response as I have overlooked. Thank you for dropping by. I never used pandan extract in all my baking. 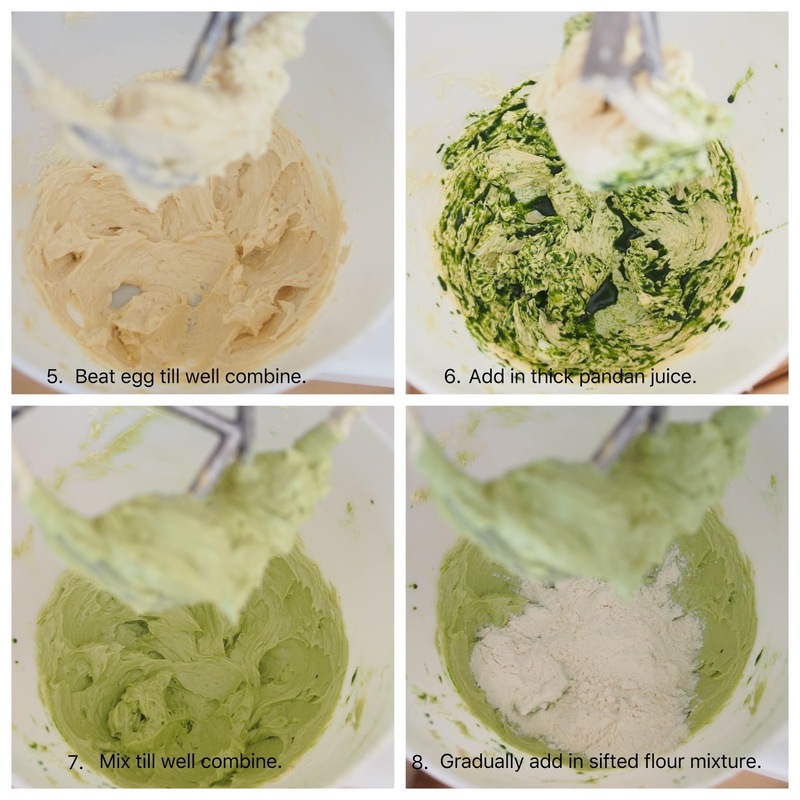 I use only natural pandan juice or paste. I am not too sure the quantity to be used. You may want to add minimum quantity first and gradually add in to get the colour and taste you like? Thank you for your comments. Unfortunately, I have accidentally deleted from here. However, I managed to read it from my email. Apologies for this. Hi Yeanley, is there any way to prevent the dough out of shape? I notice it sort of melted and shape lari. Also, may I know the tip you use? May I know which recipe have you tried? Recipe 1 or 2? Baking powder from Recipe 2 causes the dough to rise. You can omit the baking powder like recipe 1. But, the cookies will not be that crispy. I used Open Star Tip #21. Hi Ally, You may try to chill the cookies in fridge for 30 minutes after piping to hold the shape before baking. Hi yeanley, I tried recipe 2 and noticed that the cookie melts in the oven and didn't retain its shape. Also the cookie ended up as a soft cookie. Baking powder used was clabber girl. What is the consistency of the dough when you piped this? Thank you for trying the recipe. I am sorry to learn this. 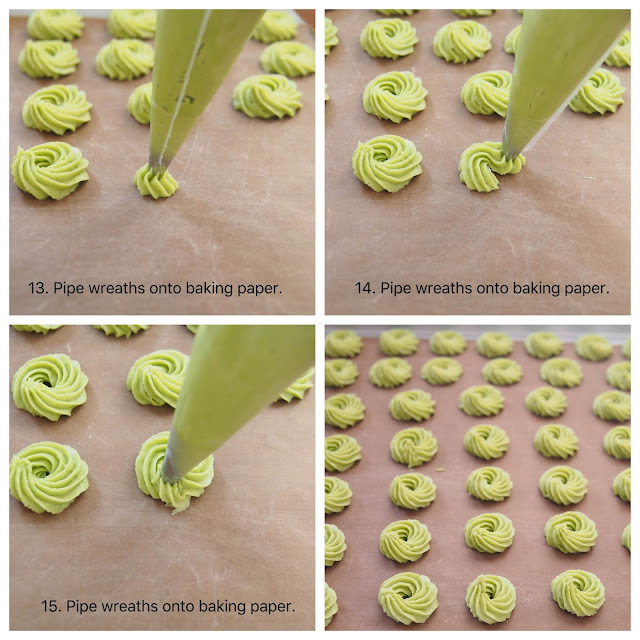 The dough is quite soft and you will be able to pipe it easily. Did you measure the ingredients correctly? Sound like a lot butter used in your dough. It melts easily is because the butter ratio is the same or more than flour. The cookies is soft is because too much water added. Please use very concentrated or thick pandan juice too. Sorry to hear this.. May I know what happened? Hi.. May i know if i can use Recipe 1 ingredient amount but just add one egg so that it becomes Recipe 2? For my first try, just wanted to use a smaller portion of ingredients.. Thank you for dropping by. You can try that. But, I am not sure if 1 egg will be too much for Recipe 1. I guess it think it should be ok..
Hi may i know why is there an egg added in recipe 2? ?but recipe 1 no egg? Thanks for asking. I was comparing the result of with and without egg. With egg added gave me that crunchy light cookie as I mentioned in my above post. North indians won’t know what pandan is.so please let us know what is it. Pandan leaf is screwpine leaf. It is used widely in South Asian and Southeast Asian cooking as a flavoring. Please click here or google for Pandan.